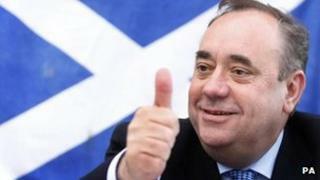 Image caption Foillsichidh Mgr Salmond am Pàipear Geal air neo-eisimeileachd Dimàirt. Là mus tèid am Pàipear Geal air neo-eisimileachd na h-Alba fhoillseachadh, tha am Prìomh Mhinistear Ailig Salmond ag ràdh nach robh dùthaich riamh ann an suidheachadh nas làidire airson neo-eisimileachd. Bha Mgr Salmond a' bruidhinn agus e ag innse gur ann air 24mh am Màrt 2016 a dheadh Alba na dùthaich neo-eisimeilich nam bhòtadh an sluagh air a son san referendum an ath-bhliadhna. 'S ann air an là sin a thachair Aonadh nan Crùintean ann an 1603, agus Aonadh nam Pàrlamaidean ann an 1707. Tha na pàrtaidhean dùbhlanach ag ràdh ge-tà, gum feum am pàipear na dùbhlain a bhiodh mu choinneimh na dùthcha aithneachadh. Tha Ailig Samond ag ràdh gur e am Pàipear Geal seo plana mionaideach airson obraichean a chruthachadh, fàs a thoirt air an eaconamaidh agus Alba a dhèanamh nas tèarainnte. Canaidh Mgr Salmond gur ann a tha staid ionmhais na h-Alba nas fheàrr na an còrr de Bhreatainn, agus gu bheil sin na bhunaid airson tuilleadh fàs. Cuiridh sinn air adhart sreath de mholaidhean reusanta, agus iarraidh sinn air daoine beachdachadh orra, agus breithneachadh a dhèanamh air an t-sealladh chiallach a tha seo. Tha e ag ràdh gun toir am pàipear, anns am bi 670 duileag, cothrom dhan phoball na planaichean sin a sgrùdadh. Tha na dùbhlanaich ag ràdh ge-tà gum feum am Pàipear Geal na ceistean mòra mu ghnothaichean ionmhais a fhreagairt. Thuirt Mgr Salmond gun cuireadh am Pàipear Geal às do theagamh sam bith a th' aig daoine mu chomas na h-Alba soirbheachadh mar stàit neo-eisimeilich. Coinnichidh Caibineat na h-Alba gu foirmeil aig Ionad Saidheans Ghlaschu Dimàirt, air thoiseach air foillseachadh a' Phàipeir Ghil, mus till buill a Dhùn Èideann airson òraid sa Phàrlamaid. "Tha Riaghaltas na h-Alba a' cur an cèill phlanaidhean airson an àm ri teachd, agus bho Dhimàirt bidh sinn ag iarraidh sluagh na h-Alba air fad a thoirt a-steach gu deasbad mu mar a chruthaicheas sinn Alba nas fheàrr," thuirt Mgr Salmond. "Cuiridh sinn air adhart sreath de mholaidhean reusanta, agus iarraidh sinn air daoine beachdachadh orra, agus breithneachadh a dhèanamh air an t-sealladh chiallach a tha seo. "Mìnichidh am Pàipear Geal mar a tha suidheachadh ionmhasail na h-Alba nas fhalainne na tha suidheachadh na RA, agus gu bheil sinn air barrachd chìsean a thogail bho gach duine na thog an RA gu lèir gach bliadhna den 30 bliadhna mu dheireadh. An ceann 48 uairean de thìde, cha bhi dol às aig Ailig Salmond bho bhith a' freagairt nan ceistean doirbhe. "A thuilleadh air a bhith a' foillseachadh a' bhunaid sheasmhaich seo, cuiridh am Pàipear Geal fòcas iomairt an referendum gu soilleir air na tha ri teachd do dh'Alba, agus na gnothaichean as cudromaiche do dhaoine - obraichean, fàs eaconamach agus tèarainnteachd," thuirt e.
Ach tha luchd an Aonaidh ag iarraidh fhreagairtean air ceistean eile, leithid dè an t-airgead a bhiodh aig Alba, agus dùbhlain ionmhasail nas leantainniche. "An ceann 48 uairean de thìde, cha bhi dol às aig Ailig Salmond bho bhith a' freagairt nan ceistean doirbhe," thuirt Rùnaire na h-Alba, Alasdair MacIlleMhìcheil. Thuirt ceannard na h-iomairt Nas Fheàrr Còmhla, Alasdair Darling, gun robh coltas nach tachradh aonadh airgid idir, agus e ag iarraidh air an SNP innse mun "Phlana B" a th' aca.